Last night while sitting on the deck enjoying a much needed phone conversation with an old friend - I caught a glimpse of 'something' out of the corner of my eye. Was it? .... why yes - I think it was! The first firefly of the season. For just a moment the conversation on my side stopped as I watched him (yes him - those with flashing tales are male - trying to attract the attention of a female hiding out in the grass!) flitter along the grass line - then up into the lower branches of the tree, then back down again to the grass line - blinking and flitting and trying to make an impression. I wonder if he did? Did anyone else notice he was there? They are magical to watch - and soon I saw a couple more....dashing and darting and blinking. And I remembered other nights. Nights when our daughters were younger and still living at home. Nights of playing badminton in the back yard. How fun when one of the fireflies made direct contact with the badminton racket. Greenish-yellow glowing goo was on the strings. Then it was on fingers for pretend 'sparkling diamonds'. Then on faces for 'war paint'. Jars of sparkling, dancing light - caught and released. Squeals and laughter and contentment. Memories are good. That's a good thing about this time of life. In looking back, it's easy to filter out those things that don't really matter and focus on the good. 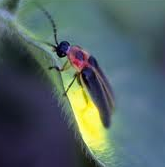 Enjoy the firefly moments in your life - no matter how and where you find them! Awwww! I mostly grew up in Ohio and loved fireflies, but now I'm in Utah and haven't seen them for years. My children have never seen one. Sad for them.